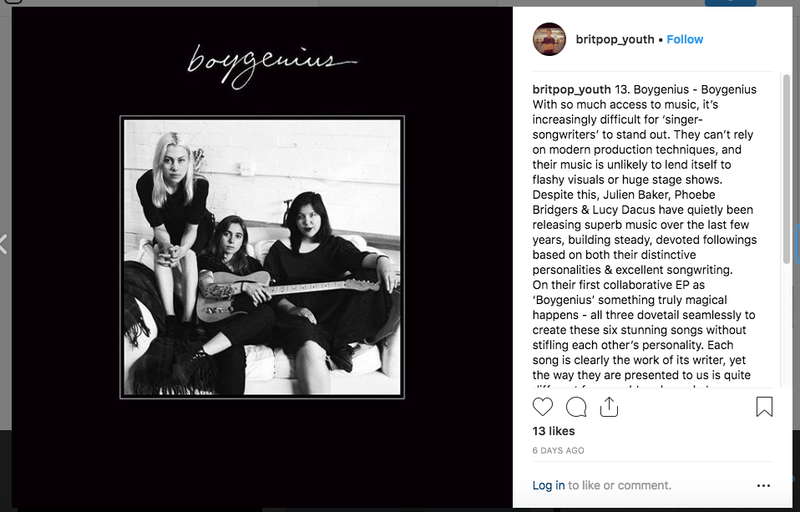 If one of your New Year’s Resolution is to listen to more new music, check out @Britpop_Youth & his best of 2018 round-up. Following on from my previous post, here’s a few of my favourites from the 10-1 rundown. I currently have ROSALIA on repeat & I definitely don’t speak Spanish, so don’t let that stop you from checking her out! This video is awesome, oh & this & if you’re still unsure I have 6 words for you, JT ‘Cry Me A River’ cover! Every year my music-loving partner, Alex, compiles his Top 20 Albums Of The Year. Whilst few of us even buy 20 albums in a year, for Alex his love for new music runs deep. Cut him & the boy bleeds niche music forums & perfectly curated playlists! 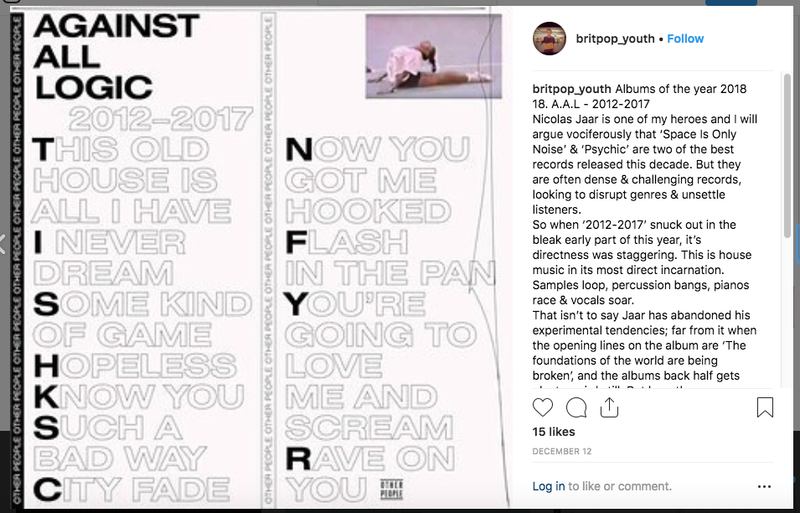 Not in a pretentious Record Shop owner kinda way - I mean, his 2017 album of the year was Lorde. He just loves interesting people doing innovative things in music. Alex produces his Top 20 write-up each year for two reasons; 1) to indulge his love of writing (Aston Villa is his other hot topic which I try & fail to muster the appropriate enthusiasm for) 2) in the hope that readers listen to something that they otherwise wouldn’t. What brings him as much happiness as new music? Sharing new music with others. Through osmosis, Alex’s listening frames my listening. Whether I’m replying to emails or on the tube to Portobello at 6am on a Saturday morning, his playlists & album suggestions are often my company. Although it’s fair to say my listening equates to a teeny weeny fragment of his, each year Alex introduces me to things I too fall a little bit in love with & that’s why I’m including this here in LoveNotes. So, of his Top 20 through to 11 here are a few of my favourites. 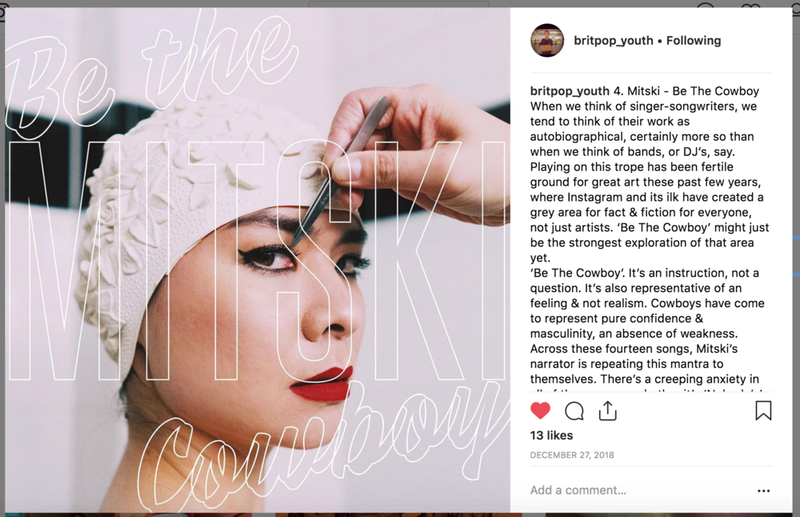 Tap the image to read the full review or better still, tap here for his full Instagram countdown. A little Christmas reading / listening to punctuate the coming days of festive food comas & sofa slob-outs! I’ll follow up with 10 to 1 next week.